The second Royal Doulton figure to buck the generally lukewarm market within a fortnight, a 'Double Jester' figure designed by Charles Noke, was the star of a 1000-lot collectables sale at John Nicholson’s (24% buyer’s premium) at Haslemere on September 7. 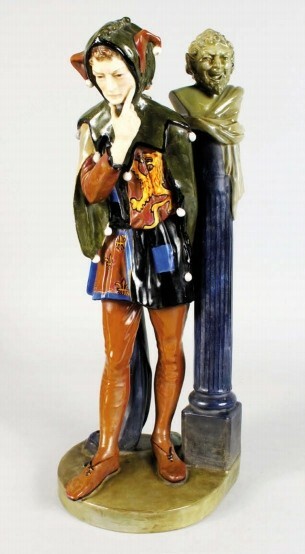 The Royal Doulton 'Double Jester' figure – £6000 at John Nicholson. Back on August 24, Noke’s 1917, 12in (30cm) tall Fisherwoman brought £6900 against a £300-500 estimate at Glasgow auctioneers McTear’s, the highest price in recent years for a HN series figure (ATG No 2307). The 17in (43cm) figure at Nicholson’s was inscribed to the base with its alternative title Two Heads Are Better Than One plus CJ Noke, Painted by Doulton & Co. HN 365. It had a small production run from 1920-38. There was some restoration to the pillar but, with some precedents available, it was estimated at £3000-5000. Double Jester went to a UK collector at £6000. Three other scarce figures for the early years of the HN series were offered. A 9in (23cm) single Jester HN71 went above hopes at £600 but both a 13½in (34cm) Moorish Minstrel HN34 and a 12in figure by EW Light of Myfanwy Jones HN39 went below estimate at £600 and £800 respectively. Surprise of the sale was a large Georgian glass decanter of shouldered ovoid shape engraved with an urn, scroll and fruiting vines, and in large capitals, the label Punch. Huge at 18in (46cm) tall – and with an unusual label – the decanter was consigned for a general sale but auctioneer Alex Chalcraft promoted it to a catalogued sale with an estimate of £100-150. Made perhaps c.1765, and retaining its original, well-fitting stopper, it sold at £2800.